Your issuing Police or Sheriff's Department requires that all new CCW applicants attend and pass a CCW training course. The curriculum for that course must include lessons on gun safety, permissible use gun laws, a written exam and a shooting proficiency exam. Our class is designed to exceed the curriculum requirements set by your issuing county / jurisdiction. 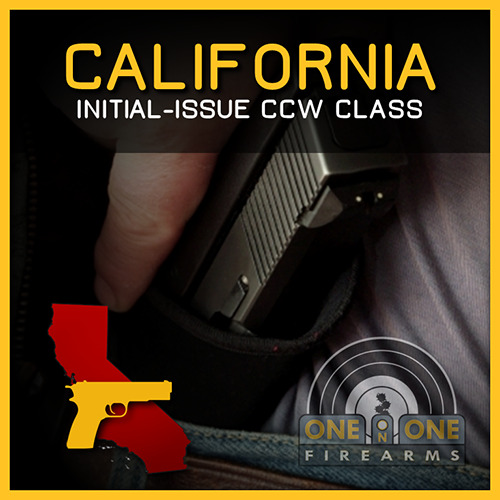 This California CCW 16-Hour Initial-Issue Class is recognized by Sacramento, Yolo, San Joaquin, Placer, El Dorado, Nevada, Amador, and others*. This class includes qualifying with one handgun. Additional gun qualifications are $10 each and can be purchased through this website or during class. Most departments limit the number of guns you can have on your permit to three at any one time. A pdf document with more info on the class you select will be emailed to you when you purchase the class. 1. Your name exactly as you want it to appear on your certificate. 2. Make, model, caliber and serial number(s) of each handgun(s) you intend to qualify with. Just because you earn this certificate does not mean that you absolutely will receive a CCW permit. There are many other variables involved in the issuance process. The decision to grant a CCW permit will be ultimately determined by the Police or Sheriff's Department that you applied with. We are always looking to add more approved jurisdictions for our CCW training. If your county / jurisdiction is not listed, email me us train@oneononefirearms.com for more info. Note: Range fees of $7 to $16 (depending on Sac Valley Shooting Center Membership) are the responsibility of the student, and can be paid directly to your Instructor on range day. COURSE OPEN TO: Any student qualified to obtain their California Concealed Carry Permit. Students should be actively engaged with their issuing county / jurisdiction in the CCW application and interview process. We will break for lunch at approx. 2 PM. You have 1 hr to get lunch and return to the classroom on Rockingham Dr.
A strong side, hip holster for each gun - must cover the trigger, and appropriate belt. Outside the waist band is preferred. We do have some holsters available to loan. Check with us for availability. Magazine pouch and/or speed loader holders for your belt are recommended but not required. Eye and ear protection is required but amplifies hearing protection is recommended. RANGE FEES: Range fees are the responsibility of the student, and can be paid directly to your Instructor on range day. Fees vary from $7 to $16 depending on range membership status. The map shown below is for reference only. Often a GPS will get directions to this facility wrong! Please refer to directions on getting to the range on the SAC VALLEY SHOOTING CENTER website at http://www.sacvalley.org/contact.html. We will break for lunch at approx. 2 PM. You have 1 hr to get lunch and return to the classroom on Rockingham Dr.